Country Living UK published this article online on January 17, 2018. To read the piece there, click here. My social life and career tether me to London, but life in the Big Smoke can wear me down, so I've learned that solitary trips to the countryside — where I can play house in a cottage like the one from my dreams — are the perfect way to relax and recalibrate. There's something about being alone in nature, in a place where distractions are scant, that quiets the mind. In my experience, it helps to do a little planning in advance — right down to the details like where you can buy groceries or rent a car — while remaining open to spontaneity. If you're anything like me, you need to feel comfortable to relax, and there's nothing worse than discovering that your Airbnb or something of the sort is a far cry from the luxury pics you perused online. At least with a hotel, you can complain if things aren't up to snuff, which could lead to a refund or upgrade. With many vacation rentals, you're on the hook. In remote stretches of the English countryside, charming Airbnbs are few and far between, but don't fret: this scarcity isn't all bad. There are endless country hotels and cosy B&Bs, not to mention some of the best vacation rental companies I've come across — some of which cater to solo travellers. Both Mulberry Cottages and Premier Cottages have petite homes in their collections, but my all-time favourite is Unique Home Stays, whose portfolio includes 163 privately owned homes across the UK. A good many sleep one to two people, making them perfect for solitary holidays. Speak to a travel adviser if you need help deciding on a cottage, and be sure to ask about dog-friendly options if you're bringing your hound. I was midway through a Cambridge Masters programme when I checked into The Parisian to knock out five essays. Within seconds of stepping into the stables-turned-cottage, I knew I was going to have a wonderful stay. The two-story house was light and airy, the perfect size for one, and had a private terrace where I sipped coffee each morning. There were little luxuries, too — a bathroom skylight, an alpaca duvet keeping me warm at night, and a welcome hamper with fresh treats and Prosecco. The owners of The Parisian recently decided to keep the cottage to themselves but, for a similar property in the same area, see the Dragonwood Boat House. Several months later, when I needed another escape from my life in Cambridge, I headed towards the Norfolk Coast, where I'd discovered a collection of five privately owned cottages. I stumbled upon Sharrington Hall, Cartshed Cottagesusing Google search terms like, "luxury, charming, cottage" and "Norfolk Coast." My flat, Seal, had two floors: like the Parisian, the ground floor featured a kitchen and living area, and the bathroom and bedroom were upstairs. Seal also had outdoor space, but because all five of the Cartshed cottages share one large structure, things were a little less private. It didn't matter, however, because I spent most of my time exploring the region. When I travel alone for one to two nights, I prefer to stay in hotels, and I'm always on the lookout for properties that have standalone structures that make me feel like I'm in a house of my own. Several months ago, as summer turned to autumn, I spent an amazing night in one of Chewton Glen's modern treehouses. I watched the sun set from my elevated perch and stargazed from the outdoor hot tub when the night air turned cool. 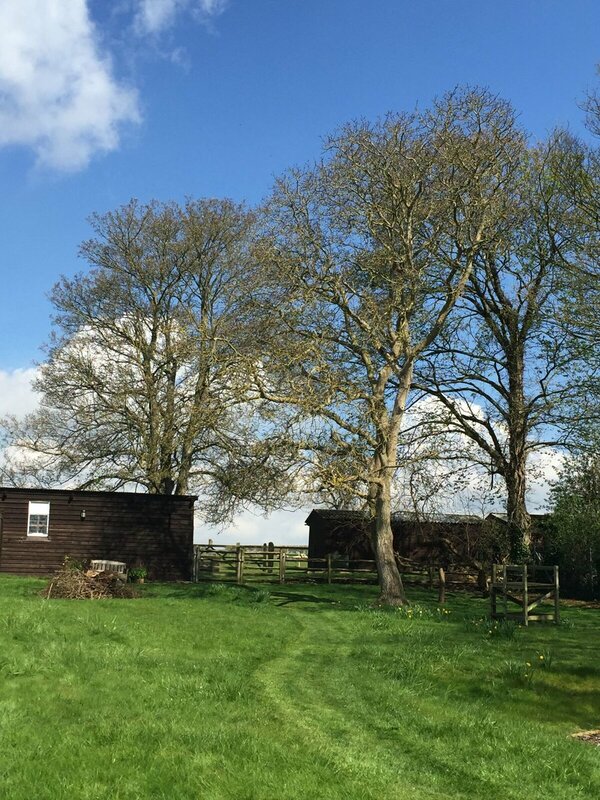 This spring, I'm checking into one of Daylesford Farm's cottages, and on my wish list are several of Unique Home Stays' Cornwall rentals (see the Atlanta Cottagebelow), as well as this newly opened tiny house called The Nook, available through Canopy and Stars, an hour from London.